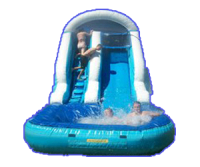 Kangaroo Bouncers has inflatable dry slide rentals that will be a big hit at your next party or event. If your hosting an event but the weather isn’t right for a water slide, no problem! A dry slide can be just as fun plus, they can be set up inside! These rentals are great for church and school events because they can be set up easily in a gym. Dry slides make it possible to still have lots of bouncing, sliding fun even in colder weather. We love bringing our inflatable dry slides rentals to parks but check before hand to make sure there will be a power source. We can easily bring a generator rental to your party if you need power. 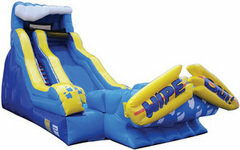 Thank you for choosing Kangaroo Bouncers for all your dry slide rentals needs. We are a family owned and operated company that has been serving the Land O Lakes and Tampa area since 2011. We only use commercial grade vinyl and heavy duty stitching when it comes to our inflatable units because safety is our top priority. When you rent from us, we guarantee you are getting the best. Our team goes above and beyond to ensure that your rentals are clean, sanitized, and in proper working order. Contact us today to learn more or reserve your rentals today.